Musical genres and their subgenres have really been getting out of control the last few years. I know you’re probably saying, “Mr. Review guy, you are always using them. So, what gives man?” Yes, I do use them to try and help the reader grab a sense of what the band sounds like if they have never heard them before. I will be one of the first to admit that all these labels are a bit much. 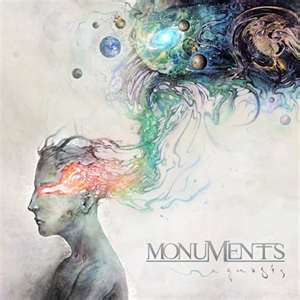 Let’s look at a new band on the scene named Monuments. They just released their debut album entitled “Gnosis”. I’ve seen this band labeled as UK tech metal, djent and progressive metal. I’m not even sure that djent is truly a genre and tech metal wasn’t in my genre to English cross reference dictionary. So, I think that progressive metal is a fairly accurate term for this band when compared to other similar bands. This album has been a very long time coming for various reasons. The band released a three track EP in 2010 entitled We Are the Foundation which featured lead singers Neema Askari and Greg Pope. 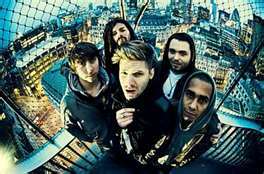 The band began working on their full length debut album and both singers left the band in late 2011. That left and the band recorded and entire album with no vocals. Matt Rose, formerly of The Qemists, was recruited and he added his vocals to the already completed tracks. The results are pretty amazing to me. There are two of the three EP songs on here: “Admit Defeat” and “The Uncollective”. I will admit that I am not familiar with the two prior vocalists, so I can’t compare and contrast Rose’s style with theirs. What I can do is evaluate Rose’s vocals on these tracks and I think he fits like a glove. I think too much fuss is being made over the difference in his style on the songs that are on here that were also on the EP. Rose’s vocals show depth and range and a level of believability. The album opens with “Admit Defeat”, which was on the EP, and it doesn’t take long for the listener to pick up on the fact that this is something quite special. Founder and guitarist John Browne, who briefly played guitar in the band Periphery, has a unique style of playing and his riffing really compliments the vocals of Rose. Rose can mix it up between screaming and an almost falsetto type of singing at times and make it all sound believable in his delivery. “Degenerate” is a bit heavier of a selection. I think that any doubts on Rose taking over as vocalist can be dismissed after listening to this song. The guy displays his range throughout the song and even his spoken word insertion is really cool. “97% Static” is a big some with an even bigger chorus. This would definitely be a great song to perform live. There’s a bit of a breakdown towards the end where the guitar parts become the focal point and they are so rich and full and it’s easy to get lost in the musicianship at that point. “Regenerate” starts off with a few simple cords being played and it builds and gets bigger and more complex as the bass, drums and other guitar join in and form a full on assault. Rose then joins in to make bring all the elements together bouncing between his growls and clean vocals. The album closes with “Denial” which features a vocal appearance from Spencer Sotelo of Periphery. It’s no coincidence of the ties between the two bands as guitarist John Browne was asked to join Periphery as a permanent member after touring with them. Overall, this is a really solid album from beginning to end. Yes, some tracks are stronger than others, but I really don’t think they are any “filler” songs. A tip of the hat has to go to drummer Mike Malyan who is a beast on this album. He provides a solid backbeat for these songs and is very impressive with his attack on the skins. The musicianship on the album is far beyond the amount of time that these guys have been playing together. I was really surprised with how tight and cohesive of a unit they truly are. If you are into bands that fall into the djent stylings or if you are into the progressive type of metal bands then this is right down your musical alley. I do recommend listening to the album more than once before passing judgment on it. There’s a lot there to sink in and one listen just won’t do. This is definitely a band to keep your eye and ears on as the year progresses.